Home Victory – Highly recommended! Read the full review HERE (Norwegian). It is hardly a surprise that we like Arendal’s loudspeakers, and especially when you want to have fun with movies in your home theater. Previous reviews of both the subwoofer and monitor strongly suggested that we had something good coming. It’s not long since we reviewed the enormous subwoofer Subwoofer 3, and after having reviewed Monitor S we were really pleased. How will it sound when we connect an entire Arendal-speaker system for home cinema purpose, we can imagine, but we have to try. 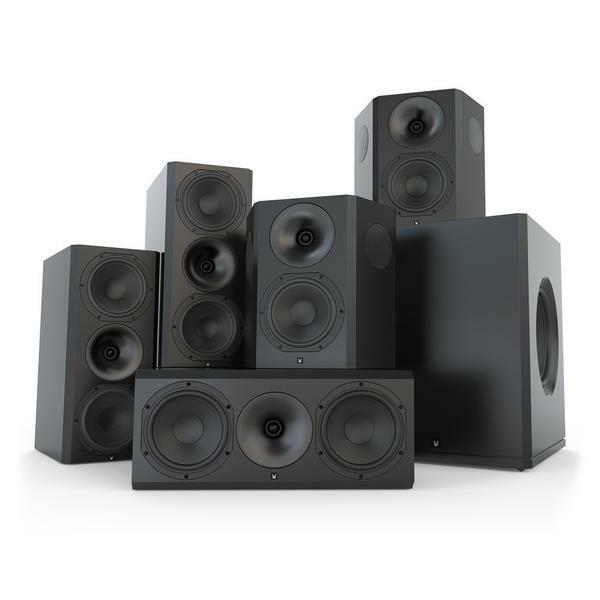 Arendal Sound has put together a system that for the time being is the most impressive you can experience in this price range. The Arendal-speakers are heavy and proper. So much so that Subwoofer 3 has to be moved around the house with the help of a large trolley. Both dimensions and weight is more than what you would imagine when you see it on the producers website. The three speakers in front are two Monitor S on each side and a laying Monitor S in the middle that is constructed as a center speaker with terminals and logo mounted the correct way for a horizontal positioning of the speaker. The two rear speakers, Surround S, complete the setup. With the entire setup standing in one room, I wonder how i was able to fit the big system. The one without S after its name. Monitor S takes some serious space, and especially when all speakers are going up on stands, and then there is the fridge-sized subwoofer that steals about a square meter of the listening room. With the current house pricing you are spending 35-40.000 Nok (3,5-4000 Eur) for the subwoofers space! The big difference from Monitor and down to Monitor S is that the smaller models has a 6,5-inch woofer instead of a 8-inch driver. It saves some room, considering that the cabinets are smaller, but at the same time you lose some ability to move air. It is not really apparent until you turn your amplifier all the way up with Blade Runner or similar. Without having the ability to do AB-testing you will still be knocked out from both these systems, and it must be said that Arendal Sound already has a sonic DNA that all their speakers we have tested have. The tweeter is mounted in a waveguide so the speakers polar response is under control. You can also view the waveguide as a short horn, where the efficiency is increased. When talking about efficiency it is worth mentioning that these speakers play about 89 dB at 1 watt. That is within what we can call normal for these types of speakers, but still not on par with for example Klipsch. They play a lot louder and deliver maybe 5-6 dB more with the same amplifier, but then again it was this about what type of sound one wants. The speakers are not a difficult load, and they also don’t play particularly deep in the bass. You can make some adjustments of the sound before you touch the amplifier at all. The speakers have two ports that can be sealed, with one open, or you can play with full bass reflex. In the last proposition the speakers dig down to just under 50 Hz. However you don’t notice these choices to much when you cross over at 80 Hz, or around there, and let the subwoofer do the rest of the job down to the absolute cellar-deep bass. The only thing you might discover is that the speakers play a little more freely if you open the ports. With a crossover at 80 Hz you can safely buy one of the biggest receivers in the market from Yamaha, Denon or Marantz and play (almost) as loud as you want. You will get dynamics that impress and it really plays more than loud enough. Still I would always recommend more power for the center and front speakers than you really need. It gives headroom, less compression of dynamics when it really hits, and even better control. Just picking out a clear dialogue in the midst of explosions where at the same time there is an orchestra playing along, is what often separate a good experience from a great one. Even if Monitor S has an even bigger and slightly more expensive brother, it isn’t first and foremost the lack of size and dynamics that are missing. The soundstage is huge and impressive, and it thumps so my pants are vibrating. The coherency in the soundstage is of course best when the entire system is from the same producer, but our experience is that shouldn’t be taken for granted. Arendals speakers are very coherent, work well together and plays with a beautiful timbre. It makes it easy for the receivers calibration (if used) to make the speakers play well together. The system clearly shows that it is a myth that only the most efficient speakers play with the most dynamics. With Arendal I started nice and easy, and got the speakers playing low, detailed and surprisingly refined, before I turned up the volume. Oh my, dynamics! It’s almost a little crazy how lifelike and dynamic these speakers are, and which dynamic contrasts they show. Movies like Blade Runner and Deadpool are a given in this context, and in its most hectic scenes the system picks you up from reality and places you straight in the middle of all the action. If you don’t get carried away with this you need to check both blood pressure and pulse to see if your alive. The bass is deep, but that is rarely enough to impress. Here it is also clean and neat, and connected with the Monitor S the bass is rich, full of timbre and seems pretty unaffected of the massive sound it needs to present. With that I mean it stays dynamic and free of distortion and noise even in the craziest scenes shown on the screen. The overlap between the bass and midbass is near perfect, and reveals that we are talking about an uncommonly clean-playing subwoofer, but also of a package of satellite speakers that behave exemplary both in terms of linearity and phase. There is a lot of talk about Blade Runner, but what I find most intriguing about the movie is the amazing music. Here all the long synth-tones are showed in all its glory and it gives sonic clues to the original Blade Runner movie and their use of Vangelis’ Yamaha synthesizers. It is so beautifully created, so integrated with the atmosphere in the picture and has such a nice, deep bass that several scenes are almost played to death before I stop. The acid-test for a multi-channel system is often music, and equipped with 2L’s Ole Bull-recording, and “I ensomme stunde”, it is so beautiful and heartbreakingly lonely that it hurts. For being safely placed in home-cinema-land, this plays music at least on par with most stuff in the same price range, even that which is dedicated for hifi-use. It may not sound “hifi-correct”, but oh my so great, open and detailed Arendal Sound Monitor S presents music. I was only partly prepared for the experience I was about to have from this system after testing parts of it on a couple of previous occasions. It surprises the entire way, and it does so either you are sitting on the edge of the chair to be able to understand everything that’s going on, or when it’s booming and exploding in all directions and really testing the integrity of your house and your own body.